The Timpani LED light from Luxli is the deep bass kettledrum of portable AC or battery powered lighting. This multi-talented instrument brings much more to the photographic game than does its one-note per drum percussive namesake. This is a deep dive review of the features of this multi-featured although at first glance, a somewhat pricey light. As a matter of full disclosure, I was given a pair of Timpani lights and batteries a few months ago in exchange for writing this review. In the interim, I have put them through their paces. What follows is not only a discussion of features. It is also a first-hand account of my putting these lights to work in real-world situations and what I learned about them. I am under no obligation to Luxli to say nice things. 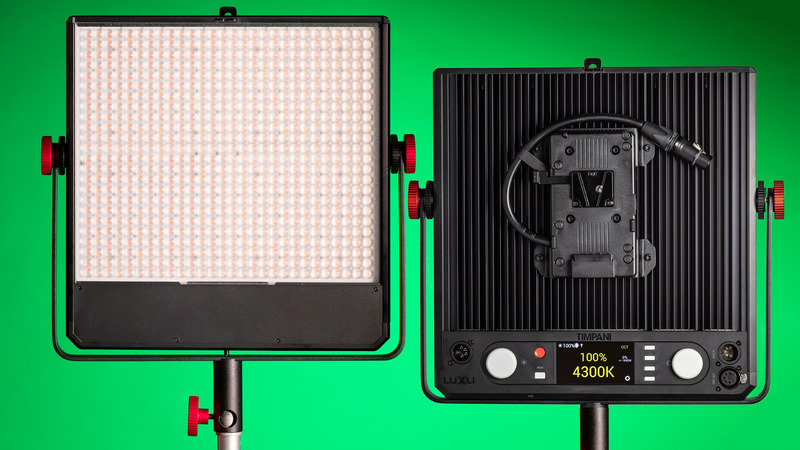 The Timpani is a 1-foot square LED light that features adjustable Kelvin temperature, high CRI rating, 150 Lee gel filter options, and 10 pre-programmed adjustable special effects. Timpani’s effects reproduce the light created by a gently burning campfire to a police visibar or even fireworks. Its 672 LEDs are rated at 50,000 hours of operation. The output is significant. At 100% it emits 3,430 lux at 3.28 feet (1 meter) which is an exposure triangle equivalent of f/4.0 at 1/80 seconds and ISO 100. This is perfect for still portraits with nice background bokeh. Turn the Tympani power to 25% and the aperture drops to f/2.0. This light is great for video too. The weight of the Tympani with yoke is short of 7.5 pounds (3.37 kg) This photo shows the LEDs through the supplied diffusion screen. Looking at the front, two red knobs at the top of the mounting yoke control the instrument’s tilt. The pair of inner black knobs allows the light to be positioned within the yoke. At the bottom of the yoke is a standard 5/8″ baby stud receptacle with tightening knob also in red. There are slots on the bottom and sides for barn doors or a Chimera Universal 1′ by 1′ Tech Bank softbox. The clip at the top secures either of these accessories. The flip side of the Timpani has power inputs, dimmer, color temp, effects, as well as professional DMX input/output and a lot more. Here is a closer look starting at the top. A 4-pin XLR socket receives AC power from a supplied power supply. A V-mount battery slot allows attaching a battery. Power goes into the light with the XLR cable attached to the V-mount. Gold mount batteries with a P-tap socket may be used with an adaptor cable. More on that later. The dimmer works from 0% to 100% brightness. The adjustment dial controls the color temperature from 2800ºK to 10,000ºK in CCT (Correlated Color Temperature) mode. CCT Chase — 2 color temperatures with green added or subtracted in a loop with control of the loop’s length. Color Chase — Continous loop of 2 pre-selected colors. Choices include color and saturation of start/stop colors and loop length. Explosion — The flash from an explosion or gunfire. Explosions per minute and duration of each are options. Fire — Simulation of firelight from a candle, campfire or big bonfire, without or with wind from a breeze to windy to a storm. Fireworks — A random color burst adjustable for the number of fireworks per minute and the duration. Lightning — This simulation has an adjustable color temperature of flashes and the pause in between strikes. Paparazzi — The look of the random firing of multiple on-camera flashes. The number of flashes per second, duration and color temperature of each are selectable. Siren — This setting is emergency lights with choices to simulate different visibars. Settings control how many times each color flashes per cycle, number of repeats and for how long. Strobe — Just what it says. Strobe light without pulses. Color and saturation are adjustable as is flashes per minute and the duration of each. The Timpani has Bluetooth 4.2 LE to pair with a tablet or smartphone. Both Android and iOS are supported. Additionally, the Timpani is equipped with DMX protocols that allow addressing up to five programmable presets. It works with a DMX controller, the app or from the Timpani itself. Controlling the Tympani is easy from the back panel. Controlling more than one that way is a pain. The free Conductor app handles this simply. Once installed on an Android or iOS device, multiple Tympani lights can be controlled from the camera or anywhere else on set for that matter. The app also controls special effects, instrument output from 0% to 100%, color filter choice, hue, and saturation, color temperature, too. Best of all, it controls all of the Luxli orchestra of LED lights — Cello, Viola and, of course, Timpani. I put these lights to use right away. The first set of photos was of the Timpani itself, lit with the other Tympani. I want to say from the start that I am a lifelong, as far as my photography career goes, electronic flash user. I like fast shutter speeds, tiny apertures for loads of depth of field in the case of products and using the lowest ISO. Making the transition to working with continuous light was a bit of a thinking reframe for me. I set up the shot, used my Illuminati meter to read the exposure and went to work. Before you ask, yes, I turned off the overhead lights which, when using flash, are not bright enough to be recorded by the camera. The first thing I discovered was that LED lights are nowhere as bright as flash. I understood this conceptually. When the reading for a good exposure was f/8.0, 1/8 seconds at ISO 125 appeared on my iPhone, I was, well, in new territory, exposure wise. I have always used a tripod so shutter speed was not an issue. I did find that I had to be much more careful with focus. Otherwise, light is light. The Timpani worked perfectly. As a matter of fact, all of the photos in this article were lit with it except the screenshots of the Conductor app. Ok. I am in love with using my phone to dial in the brightness of the light. I know there are electronic flash systems that offer remote controls (way too pricey). Controlling background by sliding my finger across the iPhone’s screen was easy and addictive. The yoke allowed positioning the Tympani to be quick and efficient. For background color, I used a Cello, also from Luxli, that I received for review as well. The app made changing color fun. Instead of having to put a gel on the light as I would do with flash, compensate for the light absorption of the gel exposure wise then make a test photo to check that the exposure was what I wanted, I moved my finger on the color grid on the app. No matter what color I chose, the exposure remained the same. NICE! Interior photographs are made with the light in the room. The architect or designer (or both) put the lights where they would paint the room in the best, well, light. The exposure is based on those lights. The hallway shown below is how it presents in everyday life. The barrel ceiling and kitchen through the rail door are well represented. There is beautiful detail in the wooden floor and the burgundy runner as well. On the right side of the image is a wooden chest that is so dark it pulls the eye from the rest of the room. It is a dark shape with no detail. The chest is really dark. It needs some warm light to open things up. The Tympani at 3200ºK lowered the contrast of the chest. The warm light makes its wood glow. An added bonus was the additional light on the portrait. Video interviews are becoming more and more important for social media, corporate and public relations. As good as DSLR video cameras are, without light, the result is ho-hum at best. I worked on a three camera shoot interviewing a local horticulturalist for the venue he maintains. I did my homework. I went to the place to scout out a good place for the video. I found it and it was in shade with broken, dappled sunlight. These shadows would not look good on the show. The answer was to light both the interviewer and the subject. The Timpani lights were perfect for the job. Their job was to balance the shadows to the sunlight. The first thing I did was to use the color measuring function of the Illuminati meter. It showed 5200ºK. I dialed that in on both Timpani lights. 5200ºK and 100% brightness did the job for both subjects in the interview. Note the gold mount battery doing double duty as a counterweight on the boom. The interviewer and subject took their places and we were ready to roll. The batteries that were originally specified for the Timpani were not powerful enough to run the light for more than six minutes. These lights want serious power. Cine-style 14.4 volt Lithium Ion units like the Watson VM-99-HCS-R batteries and dual charger with at least 90 watt/hours are required to run a Timpani. Understand that these LiPo batteries cannot be shipped by air freight. If you are ordering them be sure you have time to receive them by ground transportation. The reason I mention this is that the correct batteries would not make it in time for the interview. Note that batteries for the Timpani are an accessory available at additional cost. Fortunately, Luxli understands the needs of versatile power. I went to a local production rental house here in Atlanta and rented three gold mount batteries, a couple of adaptor plates, and a pair of P-Tap to 4-pin XLR plugs. The shoot came off without a hitch because, in large part, the Timpani lights are so well designed that alternatives, in this case, power was built in. Another advantage of using the other batteries is I could use them as counterweights for the boom holding one of the Timpani instruments. The Watson battery slips right into the slot in the back of the Timpani. All I had to do was connect the power cable. All of the functions available with AC power are there when it runs on a battery. A power meter appears showing battery life. It’s located above the light output percentage reading. A 14.4 volt 98 w/h battery in the Timpani’s V-mount plugged in & powering the light. The Luxli Timpani is incredible. It’s fully featured and then some. Most lights this size offer daylight and tungsten color temperatures while the Timpani has all color temps, 150 Lee filters plus the color wheel built in. It’s solidly built. A pair of them is easy to carry in a single case. For a photographer who is doing location portraits, small products in a home studio or video projects this is the light to own. The Timpani with AC power supply, diffusion panel and mounting yoke lists at $999.99.